Hummingbirds send gardeners into full alert when they buzz into a bed of flowers in full bloom. They never fail to excite the imagination, but not all gardeners realize how easy it is to attract them - hummingbirds are drawn to very particular types of flowers, while others they just fly right by. The long thin beak of hummingbirds has co-evolved with the tubular flowers of the world which provide the tiny birds with their primary food source, nectar. Flowers come in many shapes and sizes, but the first key to attracting hummingbirds is to plant species that fit the shape of its beak -- a thin, one to three inch straw for drinking the nectar that is held at the back of the flower. Hummingbirds will drink from almost any tubular shaped flower, but gardeners have observed -- and scientists have now concluded -- that they are most drawn to red, orange, and pink blossoms. 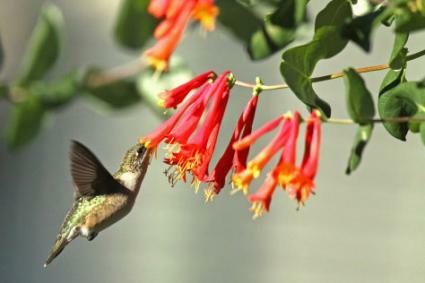 Planting annual or perennial flowers is the easiest way to attract hummingbirds to the garden. Here are some of the tried and true species that epitomize what hummingbirds like. Use these in flower borders, cottage garden, or container gardens. There are literally hundreds of species of salvia (Salvia spp.) all of which have tubular flowers and are frequented by hummingbirds. 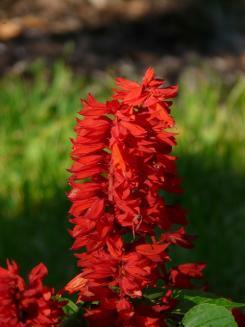 For the best results, however, try one of the many red species of salvia. Annual red salvia (Salvia splendens), which grows 12 to 18 inches tall and begins flowering within two months of planting seed, is a quick way to attract hummingbirds. Mexican Scarlet Sage (Salvia gesneriiflora), which grows as a perennial in USDA zones 9 to 10, grows quickly to six feet or more and is covered in enormous red flowers. Salvias prefer full sun, hot locations and well-drained soil. This eastern North America native grows well in full sun or partial shade and is one of the best plants to attract hummingbirds to a woodland garden. Large clusters of crimson blossoms emerge from the four-foot stalks of this perennial each summer, feeding the local hummingbird population for a month or more. 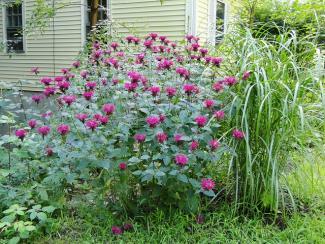 Bee balm (Monarda spp.) is hardy in USDA zones 4 to 9 and prefers rich soil and regular moisture. 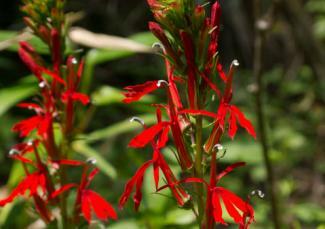 Cardinal flower (Lobelia cardinalis) is also a native plant to eastern North America, where it can be found in moist, partly shaded locations. With its fire engine red blossoms in late summer, it is a great choice to attract hummingbirds to a wetland garden, though it also tolerates average moisture conditions and can be mixed into a perennial border. The plant grows in USDA zones 3 to 9 and has the bonus of unusual purple-red foliage to go with the bright red blooms. Shrubs and trees that attract hummingbirds are less common than perennials and annuals, but there are a few. Consider the following for a hummingbird-friendly hedge or specimen tree planting. Depending on how it is trained, this plant grows as a large shrub or small tree from six to 20 feet tall. Foot long clusters of red tubular flowers appear in spring at the tips of the branches that are a beacon to hummingbirds. 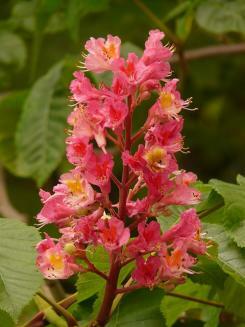 Hardy in USDA zones 4 to 9, red buckeye (Aesculus pavia) is tolerant of a variety of soil types and can grow in part shade or full sun. Catalpas (Catalpa speciosa) lack red flowers, but their blossoms have a distinct tubular shape making them one of the best large trees for attracting hummingbirds. 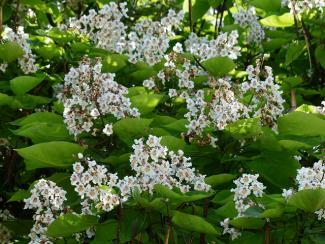 The trees have an upright form reaching 60 feet in height and large heart-shaped leaves to complement the foot-long clusters of creamy white blossoms that appear in late spring each year. Hardy in USDA zones 4 to 9, catalpas like full sun, but are adaptable to a wide range of soil conditions. Vines and groundcovers with brightly-colored tubular flowers are a good way to cover a lot of ground in a hummingbird garden, both vertically and horizontally. Fuchsias (Fuchsia spp.) are often grown in hanging baskets, where their dangling multi-hued flowers will attract hummingbirds right outside your window. They can also be planted on the ground where the their flexible stems allow them to be trained as either a vine or a groundcover. 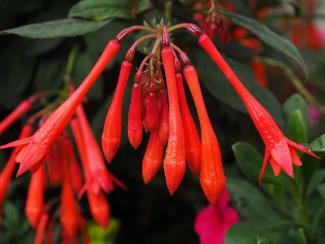 Fuchsias like part shade, cool locations and rich, well-drained soil. Try a popular pink variety like 'Trailblazer' which grows as a perennial in USDA zones 8 to 10, but can be brought indoors for the winter in cooler climates. 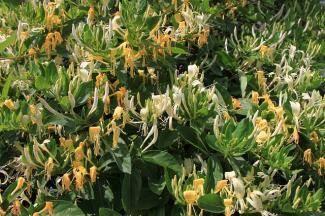 Honeysuckles can be trained on a fence or arbor, but they will form a groundcover if left to sprawl across the landscape. Their long tubular flowers are generally white or yellow, rather than red, but they contain copious quantities of nectar that make hummingbirds flock to them. Any of the many species of honeysuckle will attract hummingbirds, but there is one variety, called coral honeysuckle (Lonicera sempervirens) that comes in a scarlet-orange color that they find particularly irresistible. It grows to 15 feet as an evergreen vine in USDA zones 4 to 10. When hummingbirds retrieve nectar from the depths of a flower, the flower is pollinated in return. This perfect ecological relationship adds a special dimension to the joy of watching hummingbirds zip around the garden.